Finding The Bloodprint promises to be their most perilous undertaking yet, an arduous journey that will lead them deep into Talisman territory. 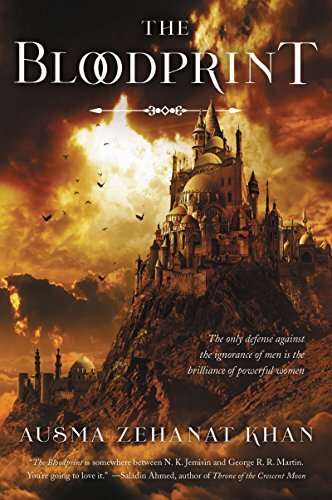 Though they will be helped by allies—a loyal ex-slave and Arian’s former confidante and sword master—both Arian and Sinnia know that this mission may well be their last. Ausma Zehanat Khan is the author of The Unquiet Dead, published by St. Martin's Press/Minotaur Books, and winner of the Barry Award, the Arthur Ellis Award and the Romantic Times Reviewers Choice Award for Best First Novel. Her widely acclaimed second novel, The Language of Secrets, was published in 2016. Among the Ruins, her third mystery was published in February 2017. She is also at work on a fantasy series, to be published by Harper Voyager, beginning October 2017. 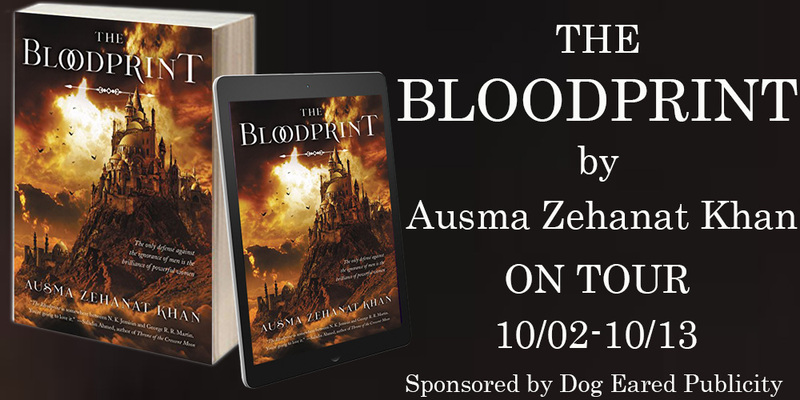 The Bloodprint is Book One of the Khorasan Archives. Formerly, she served as Editor in Chief of Muslim Girl magazine. The first magazine to address a target audience of young Muslim women, Muslim Girl re-shaped the conversation about Muslim women in North America. The magazine was the subject of two documentaries, and hundreds of national and international profiles and interviews, including CNN International, Current TV, and Al Jazeera "Everywoman". 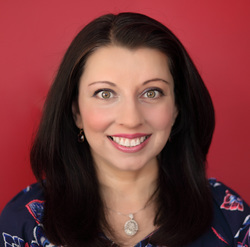 Ms. Khan practiced immigration law in Toronto and has taught international human rights law at Northwestern University, as well as human rights and business law at York University. She is a long-time community activist and writer, and currently lives in Colorado with her husband. Did the Bloodprint represent deliverance or deception? There were only three among them who would be able to read it, even if by some fortuitous working of fate, Arian was able to find it. Herself, Ash, and Ilea. And why would the Black Khan help them? Solely for the sake of the Sacred Cloak? She raised her eyes to his face. Thief, her eyes called him. And liar, as well. A glimmer of amusement in his eyes suggested he fully understood the things she hadn’t expressed, her private dismissal of his character. No, Arian thought. He wouldn’t be. And he’d evaded the more important question. She returned to it. It was important to her that she convince him of this, though she couldn’t have said why. His eyes narrowed, as if he’d grown tired of her. His words challenged her to deny him. An indefinable expression crossed Ilea’s face. Why not? And then realization struck Arian. For all of her discouragement of Arian’s efforts with the slave-chains, Ilea had expected Arian to bring the Cloak to Hira. How else could she have known to make her bargain with Rukh? She had known Arian would seek it. And she had meant to trade it away. She was swamped by a feeling of grief. How had she and Ilea come to this point? “My actions?” Arian echoed the words without understanding their meaning. Ilea’s response was cruel. She had found a way to strike back. Arian blanched at the words. Was the High Companion right? Had she brought destruction to the Citadel? When everything she treasured was at Hira? The Black Khan murmured something to Ilea, and the waters of the All Ways resumed their careful dance. Ilea crossed her arms, pressing both hands to her circlets. She waited impatiently for Arian to mimic the gesture. I’ve been waging this war for a decade. At too great a cost, she now realized. But Arian accepted the Audacy’s rites. The time for dissent had passed. She had no choice but to seek out the Bloodprint. Or face the end of the world.